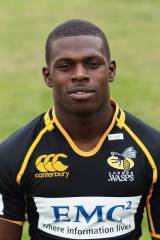 Christian Wade is one of the rising stars of English rugby who made his England debut against Argentina in 2013. An England Under-20s and England Sevens international, the hugely-talented winger made his name at Premiership side London Wasps where he carved out a reputation as one of the best finishers in the country. Nine tries in the 2011-12 season earned him selection for the summer tour to South Africa and while he failed to break into the Test picture, a try against the Barbarians at Twickenham and a hat-trick in England's tour victory over the South African Barbarians South in Kimberley underlined his potential. His star continued to rise during the 2012-13 during which he scored 18 tries in 26 appearances and claimed a unique double at the Rugby Players' Association awards, winning both the players' player and the young player awards. Selection for England's tour of Argentina followed and he made his Test debut in the first Test victory against the Pumas before being handed a call-up to the British & Irish Lions' tour to Australia as injury cover.